NOLITA, Manhattan (WABC) -- A dog given to help console New York City firefighters in the days after the terror attacks of September 11, 2001, has died. 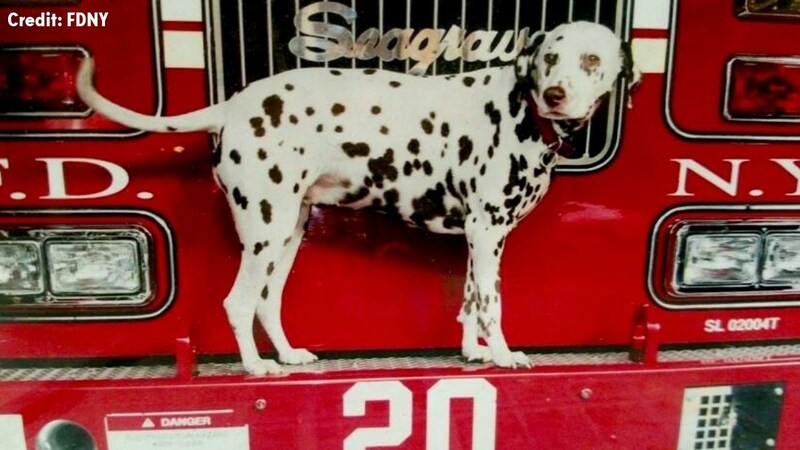 "Twenty," a Dalmatian, passed away Tuesday after 15 years of service, the FDNY said on its Facebook page. Following the events of Sept. 11, 2001, the FDNY said condolences from around the world poured in, but one gift really stood out. Sheriff's deputies from Rochester, New York, delivered "Twenty" to Ladder 20, located in the Nolita section of Lower Manhattan. Ladder 20 lost seven of its members when the North Tower of the World Trade Center collapsed on Sept. 11. The firefighters were on the 35th floor. "She became our mascot and companion," said the FDNY on its Facebook page. "She really helped to build the morale in the years following 9/11. I can't say enough about what she did to help us. She went on all the runs, she'd jump in the truck, stick her head out the window and bark." The FDNY said Twenty became a local celebrity, too. "Today, Twenty has taken her final run to Heaven. Rest in peace, man's best friend," said Lt. Gary Iorio from Ladder 20.